C1592. MICHAEL TILSON THOMAS Cond. 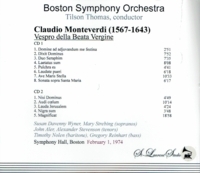 Boston Symphony Orchestra, w.Susan Davenny Wyner, Mary Strebing, John Aler, Alexander Stevenson, Timothy Nolen & Gregory Reinhart: VESPRO DELLA BEATA VERGINE (Monteverdi), Live Performance, 1 Feb., 1974, Symphony Hall, Boston. (Canada) 2-St Laurent Studio YSL T-550. [A brilliant performance, beautifully displaying the splendor of the Symphony Hall acoustic.] Transfers by Yves St Laurent. "The Italian composer Claudio Monteverdi was arguably the most important musician of the first half of the 17th century. He absorbed the musical style of the late Renaissance and, in his early works, helped bring it to its highest expression. He also pioneered new compositional techniques in his madrigals and other vocal works, effectively laying the foundation for many of the stylistic conventions of the Baroque. To the nascent genre of opera, he brought the power of a musical imagination unrivaled in his own lifetime, together with formal skills and psychological insights among the most impressive of any composer in history. He created works of extraordinary stature in nearly every significant form of the day. 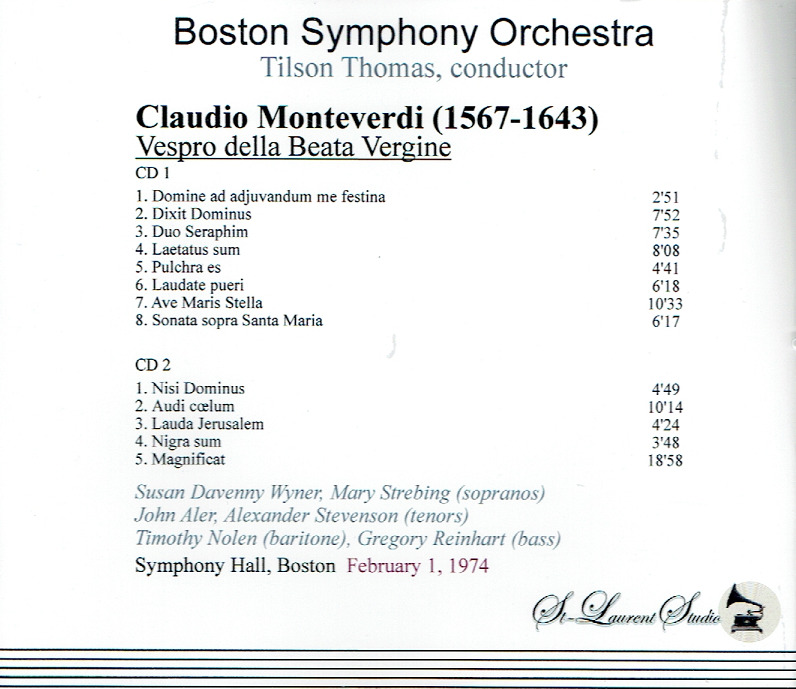 In 1610, Monteverdi published a grand collection of church music, including a mass in the old style and a set of vespers demonstrating his mastery of the new style (in its use of the figured bass line, voices and instruments in combination, dance forms, virtuoso solo singing, and operatic declamation) alongside elements of the old (cantus firmus technique, divided choirs, and a strict a cappella polyphony). 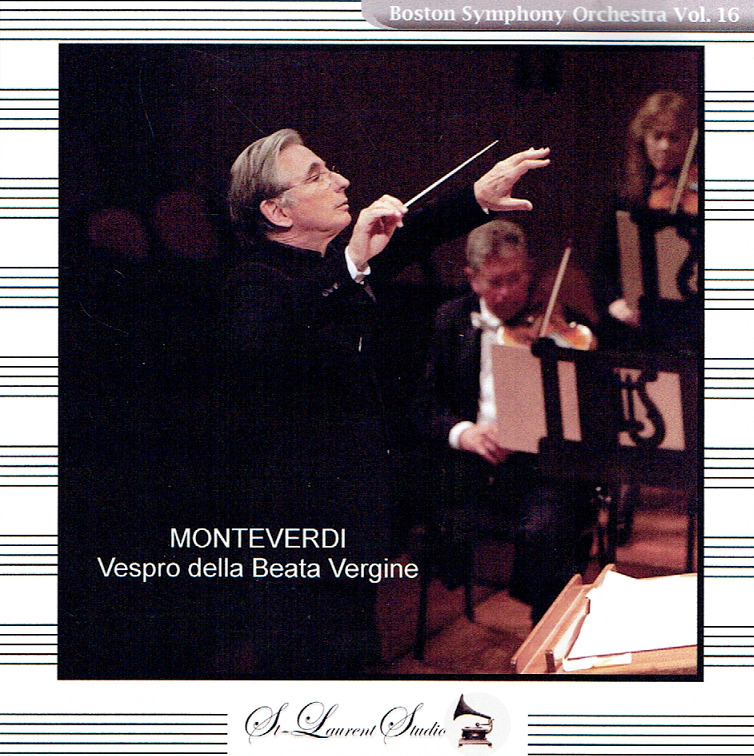 The VESPRO DELLA BEATA VERGINE were written as a kind of demonstration piece: an example of what can be done setting texts in different styles, particularly the new theatrical style (the foundation of opera) of which Monteverdi was a great pioneer. Instead of hearing the flowing, closely knit counterpoint expected from a composer like Palestrina of the preceding generation, you hear something that's half opera and half dance. It's a marvelous mélange of styles." "When conductor Michael Tilson Thomas emerged as the wunderkind of American music and heir apparent to Bernstein in the early 70s, the London Symphony Orchestra was the first orchestra to invite him to perform in Europe. The relationship has proved a long and fruitful one, with him becoming their principal conductor from 1988 to 1995 and principal guest conductor ever since. But while the 40 years since his debut has seen Tilson Thomas make the familiar journey from enfant terrible to eminence grise, he says what is more remarkable is how little the essential character of the LSO has changed over the same period. Tilson Thomas was born in Los Angeles in 1944. His father worked in theatre, TV and films, his mother was head of research at Columbia Pictures and his grandparents had been renowned figures in Yiddish theatre in New York during the early part of the 20th century. He says the default tone of the family was the Jewish-inflected wisecracking that became the default setting of American mainstream humour. 'You always had to be ready with a quick line. It took me a while to realise that wasn't how you related to every aspect of the world, especially the press. But it has stuck with me. I am very serious about the way I approach music and my aspirations for it, but I don't assume the mantle of a professor. Maybe because I have this absolute need for excellence that I fear I could tear things apart if I wasn't a little bit light about it as well'. As a child he was prodigiously talented and was not only interested in the likes of Stravinsky, Boulez, Stockhausen and Copland, but he also worked with them. He first saw Stravinsky perform when aged 11, was involved in his rehearsals by 16 and at 19 was playing under his direction. 'I had a very clear exposure to his spirit and to his insatiable curiosity about new music'. Did he ever become blasé about such privileged access? 'Oh no. In Los Angeles musicians do get used to having major celebrities around. But whenever Stravinsky came into a session, the whole orchestra would stand up'. Tilson Thomas won a scholarship to study conducting at Tanglewood where he won the prestigious Koussevitzky prize in 1969, the same year as he was subject to the classic showbiz break when he took over the Boston Symphony Orchestra, mid performance, when a conductor fell ill. It was a curious echo of what had happened to Leonard Bernstein a quarter of a century before when he had made his debut as a replacement for Bruno Walter with the New York Philharmonic. Bernstein became something of a mentor to Tilson Thomas at a time when, 'it was important to have a older colleague who I could trust. He was generous with his time and I could call him and ask him things. And that whole snappy, rapid-fire comeback thing came in very handy. That was very much his preferred form of communication. It was all fast repartee. He enjoyed being competitive, slapping things back and fore and testing people'. In 1971 Bernstein passed on his role conducting CBS's televised Young People's concerts to Tilson Thomas. The same year Tilson Thomas became music director of the Buffalo Philharmonic Orchestra where he pursued his commitment to American music and began to cement a reputation as the premier interpreter of the likes of Copland, Ives and Reich. It was while conducting a performance of Reich's Four Organs at Carnegie Hall in 1973 that he found himself featuring in what has been described as the last ever classical music riot. 'I didn't expect that response, and it really did go on for an extended period of time. By the end it was like a Roman arena with all the booing and shouting, but it was elating to realise that an audience could still react that way. We came off stage and Steve was ashen-faced. I said: 'By tomorrow morning everyone will have heard of you'. And that is precisely what happened'. In his early career Tilson Thomas was not only a challenging figure to audiences. There are stories of strained relationships with players and administrators, and he admits things were often 'fraught - I was finding my way. When I look at young conductors today I so sympathise with what they are going through. That process of having to learn so much while being under such close scrutiny is difficult. Musicians who worked with me then and who work with me now say that I'm the same in that I want the same things, and am interested in the same things. But the good news is that I've become way clearer about how to achieve them'. It wasn't until Tilson Thomas was appointed as the San Francisco Symphony's 11th Music Director in 1995 that he really had a stable American base. The longevity of the appointment has been one of his greatest satisfactions. 'It allows you the time to confirm beliefs that you have, to build audiences and encourage their adventurousness of spirit. And when it goes well, everyone co-mingles in such a way that you wonder who is actually making this wonderful music. It is as if it is just happening. The most important thing about music is what happens when it stops, what remains with the listener, what they take away. A melody, rhythm, some understanding of another person or another culture. The way those experiences add up, in the soul of a person over the years, is the biggest prize classical music possesses. It is an art form in which instinct and intelligence are equally balanced. They take the measure of one another and they reflect, across centuries and composers and pieces, how our minds really are and the way our consciousness is ordered. You want to shake people even when they're not listening to the music'."